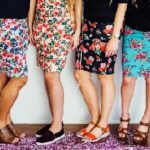 This dressmaking course will teach you how to make your own unique clothes that fit perfectly. Or if you’ve already done a bit of dressmaking, then you can improve your techniques. I’ve been dressmaking since I was at school. I’ve also studied Bridalwear and Tailoring so I’ve learned lots of tips and tricks that give your projects a polished look. During this course, I’ll be focussing on teaching technique so your clothes won’t look ‘Homemade’, but ‘Handmade’. No-one will believe you made them yourself. 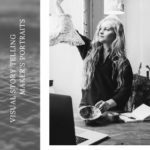 If you’ve already familiar with dressmaking techniques and commercial patterns and you’d like to learn pattern cutting, then you can do this here too. You should be able to use a sewing machine confidently, have had practice making at least one or two craft projects, and have an awareness of basic seams and hems. If you do not, then I recommend you take one of my Beginners classes first. A small class size (Maximum 4 students) ensures I’m able to give you lots of individual attention on your own choice of project. This 8-week evening class in foundation sewing skills will not only teach you how to use a sewing machine, but also some foundation dressmaking skills. Absolute Beginners. No previous sewing experience is required. If perhaps you’ve had a long break from sewing and would like a refresher, then this class is suitable for you too or try my Refresher Sewing Class. a mini-project to give you experience measuring and cutting fabric. Fabrics are provided for the first 3 weeks. After that you’ll need to bring your own fabric for your tote bag, and your pattern, fabric and any other items required to make the skirt. I’ll provide a list of things you need once you’ve booked. 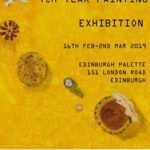 The Maker’s Portrait is a project that seeks to bring together a community of creatives and makers around Edinburgh, where you as a maker / artist can share your story, skills, inspirations, spaces and day-to-day life. It also aims to show the human behind the social media, a real person with dreams and struggles that enjoys the handmade way of life. If you are working with metal, clay, fabric, yarn, glass, paint, wood … I will love to hear from you. During February I will be taking the portrait of 5 residents of St. Margaret’s House for free, please if you want to be part of this platform contact me on brenda.rosete@gmail.com to book a 30 min. session at your studio. Gray’s School of Art will be displaying the work of their 4th year students as part of their Interim Exhibition. Opening night is Saturday the 16th of February betwen 6pm and 9pm. This workshop is available for those who have done a course and want to develop there own project under expert supervision. You can book packs of 5 sessions (five Tuesdays). It doesn’t need to be correlative but you have to use in maximum 5 months from the first session. There is also a limit to the size of panel which can be undertaken due to storage space. Looking to introduce regular creative writing to your 2019? Not sure where to start, or looking for a dedicated space to flex those writing muscles and get some wit exercise? You may need a Write Rite. 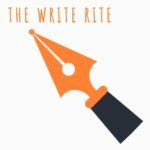 New Years Resolution or no: if you have decided that you’d like your 2019 to contain more, or more focussed, creativity in some form, then I invite you to contemplate creative writing as an option, and use our Write Rite to help introduce it to your year. On Tuesday afternoons and evenings in St Margaret’s House, we’ll hold a space for anyone looking for a calm place to write. We’ll start with a cuppa and a chat, have a gentle stretch and a few minutes of mindfulness/meditation to get in the zone and engage the senses. After that, you are free to work on your own stuff, or use any of the provided materials for writing prompts and exercises. If you’re stuck, we’ll set you a challenge. Focussed writing starts at 1:30 pm / 7:30, if you prefer to skip the socialising part. Level: Any. Creative Writing can feel like “something Other People can do”. But if you’re keen, I promise we can find a way for you to access the stories inside you. Attendance: The Write Rite space will be open for 10 weeks of habit-forming joy. Come along to the Kick-Off Meeting on Jan 22 to discuss what you’d like the space to be. Drop-ins welcome at subsequent sessions, if there are spaces left. I run fun and friendly Pilates classes held in the Drawing Room, 3rd Floor on Tuesday evenings 5-6pm. Pilates is amazing for improving posture, balance, flexibility and easing any muscle and joint niggles. Regular practice can help you build long and lean muscle, strengthen the core from within and relax the mind. It is suitable for a wide range of people, from beginners to professional sportspeople, and including pregnant women and seniors so please come along! The classes combine intuitive painting, meditation and writing. They provide a safe and positive space for free expression, with the aim to develop an intuitive approach to the creative process. Art is used as a tool for pure self expression, healing and transformation. 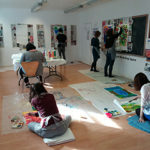 Participants have the chance to work on any subject, emotion or thought they wish to explore through the process, however a general theme is always provided. A short guided meditation opens and closes the practice and helps to relax the mind and the body. 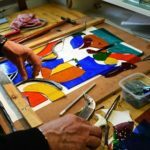 The course includes some introduction to the acrylic painting technique as well as some guidance through the creative process. No experience is required and all the materials will be provided. WHEN: Tue 22nd of January – Tue 26th of February (6 weeks course) Please book your place by the 3rd of January. For more informations and to book your space simply visit https://www.creativeflowart.com/intuitive-painting-class or phone 07556575645 (Elisa). An ideal class for folks looking to expand their sewing skills – must have a little sewing experience i.e. can thread a machine and sew in a straight line – or have attended one of our beginner’s classes. Spend 6 evenings in the studio and create a beautiful made-to-measure jacket, dress, skirt, trousers, waistcoat – whatever you like! Learn how to fit zips, make button holes, fabric properties and more!